This chic 14k Gold Baroque Pearl Statement Ring is available in white, yellow or rose gold. All prices in USD. Click here for ring size conversions. Made in NYC Please allow 2 weeks production time. 18K Rose Gold Ring with Baguette cut Diamonds Gross Weight: 2.11 Gold Weight: 2.03 Diamonds Carats: 0.387 Diamonds Color: G Diamonds Clarity: VS All prices in USD. Click here for ring size conversions. 18k Gold Celestial 5 Star Ring with 0.08ct brilliant round diamonds, available Yellow, Rose & White Gold. Dimensions: 9mm l x 23.5mm w Materials: 18k Rose Gold Gemstones: 0.53 cts diamonds, brilliant cut Made in Spain Click here for ring size conversions. Please allow 2 weeks before this item ships. Dimensions: 16mm l x 4.5mm w Materials: 18k Rose Gold Gemstones: 0.264 cts black diamonds, brilliant cut Made in Spain Click here for ring size conversions. Please allow 2 weeks before this item ships. Dimensions: 10mm l x 23.5mm w Materials: 18k Rose Gold Gemstones: 2.25 cts diamonds, brilliant cut Made in Spain Click here for ring size conversions. Please allow 2 weeks before this item ships. 1 Emerald Cut Diamond, 0.14 CT (Emerald Cut) 18 Diamonds, 0.09 CT each (F/G-VVS1/VS1) Available in 18k Yellow, Rose or White gold Made in NYC Click here for ring size conversions. Size 6 ready to ship; please allow 2-3 weeks for all other sizes. Dimensions: 16mm l x 4.5mm w Materials: 18k Rose Gold Gemstones: 0.192 cts diamonds, brilliant cut Made in Spain Click here for ring size conversions. Please allow 2 weeks before this item ships. Click here for ring size conversions. Size 6.5 ready to ship. Please allow 4-6 weeks for all other sizes before delivery. This 14K Signature Diamond Stackable Ring has a diamond weight of .05ct tw on a 1.5mm band, and is available in Yellow, White or Rose Gold. All prices in USD. Click here for ring size conversions. Made in NYC Please allow 2 weeks production time. Click here for ring size conversions. Please allow 4-6 weeks before delivery. 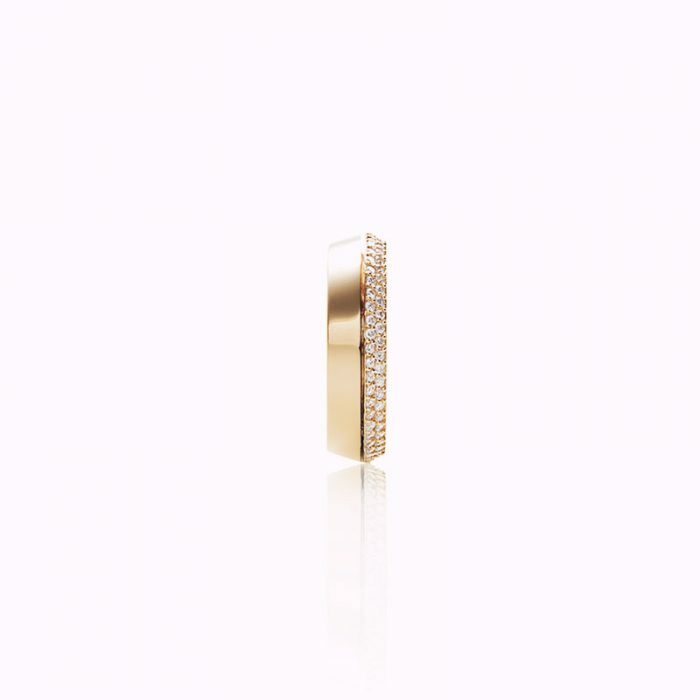 The SOUL Diamond Stacking Ring comes in solid 14k gold with a baguette cut diamond; perfect for stacking or wearing on its own. 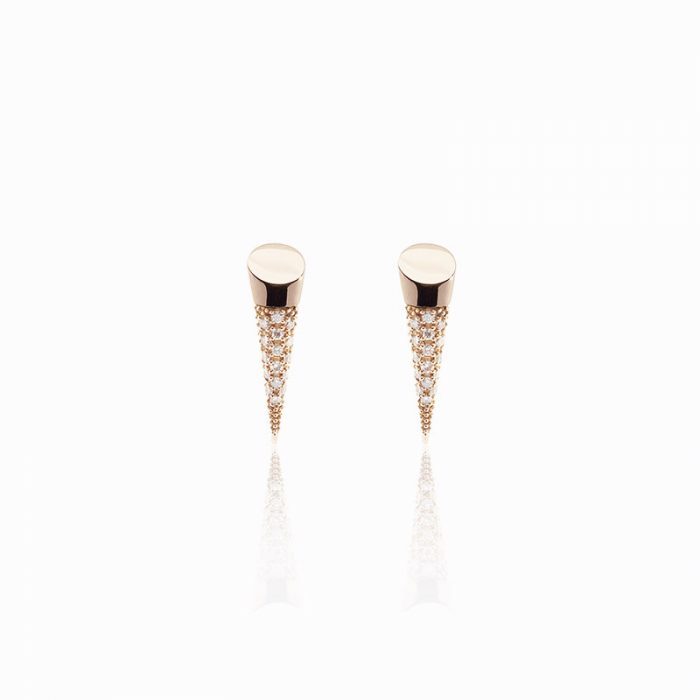 Available in Rose Gold, Yellow Gold, and White Gold; each sold separately. Diamonds Carats: 0.08 Diamonds Color: G Diamonds Clarity: VS Size US 7 Women's ships immediately; please allow extra time for other sizes. All prices in USD. Click here for ring size conversions. 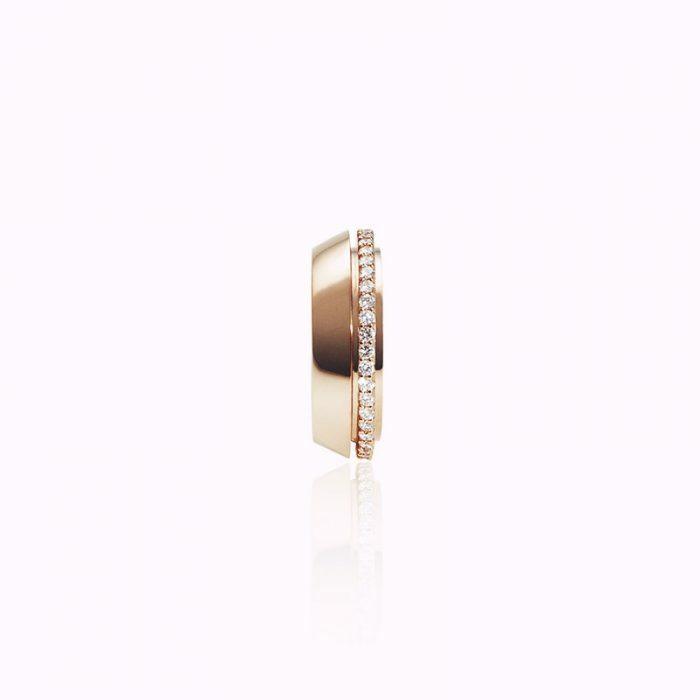 25 Diamonds, 0.12 CT each (F/G-VVS1/VS1) Available in 18k White, Yellow or Rose Gold Made in NYC Click here for ring size conversions. Size 6 ready to ship; please allow 2-3 weeks for all other sizes. 1 Trillion Cut Diamond 1pce, 0.07 CT 23 Diamonds, 0.12 CT each (F/G-VVS1/VS1) Available in 18k White, Yellow or Rose Gold Made in NYC Click here for ring size conversions. Size 6 ready to ship; please allow 2-3 weeks for all other sizes. This 14K Signature Diamond Motif Linear Ring has a diamond weight of 12ct tw and is available in Yellow, White or Rose Gold. All prices in USD. Click here for ring size conversions. Made in NYC Please allow 1-2 weeks for delivery. 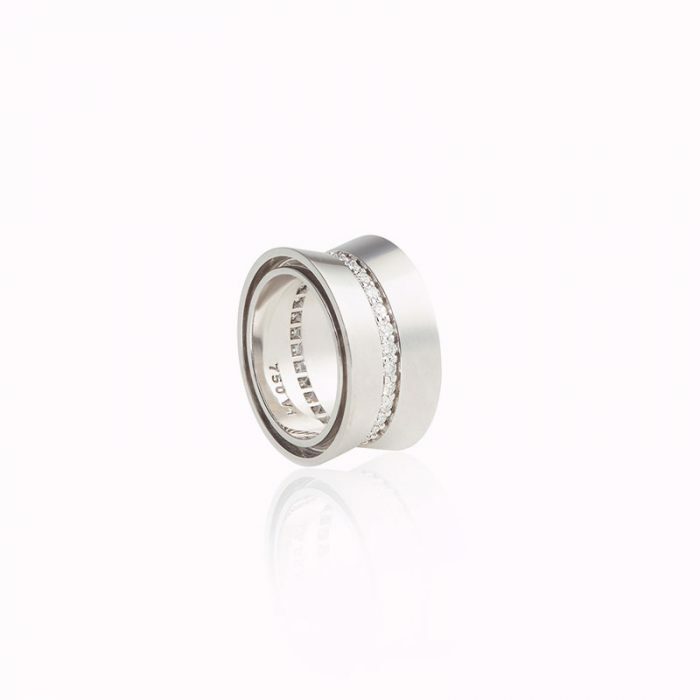 Perfect stacking ring band to wear layered with your other favourites or on its own. 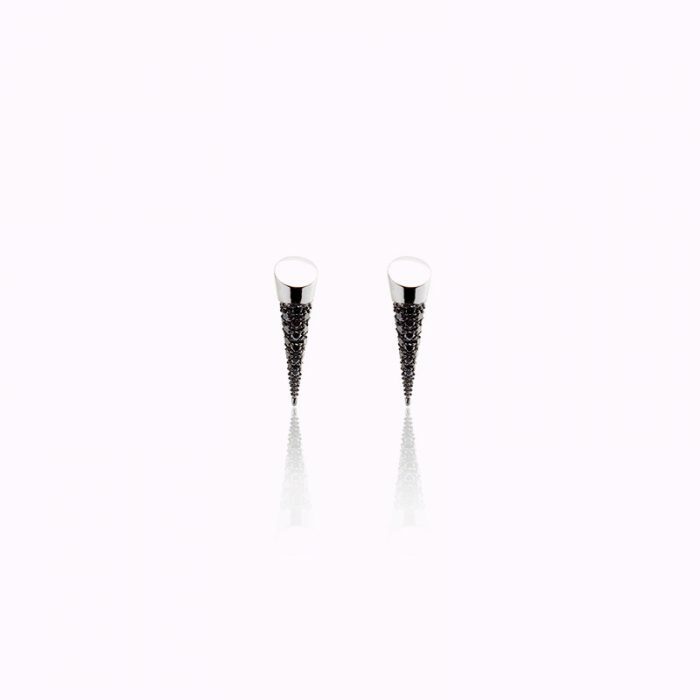 Also a great alternative for an engagement ring. 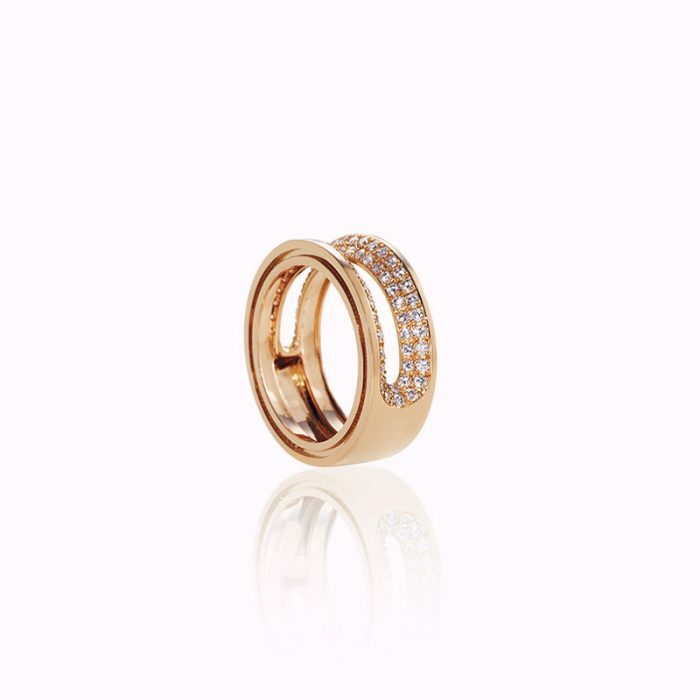 Sprinkled with White Diamonds 0.25cwt Choose Sterling Silver with Rhodium Plate, 14k yellow gold or 14k white gold Ring Size 7 available immediately, but can be resized All prices in USD. Click here for ring size conversions. Made in NYC Please allow 2 - 4 weeks to produce and ship this item. The perfect combination of comfort and dazzle, diamonds sprinkled across your fingers just like our Shadows Earring and Bar Pendant. 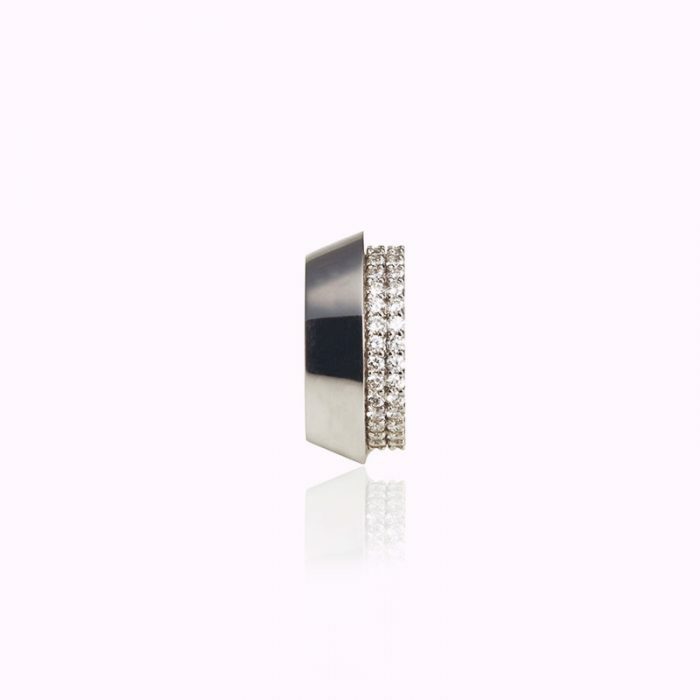 The sides of the ring bands are also tapered for a comfortable fit. Sprinkled with White Diamonds 0.27cwt Ring Size 7 available immediately, but can be resized All prices in USD. Click here for ring size conversions. Made in NYC Please allow 2 - 4 weeks to produce and ship this item.